Happy Saturday! :) Yikes...it's really been awhile since I last posted to my blog. I am so sorry about that! Not only was my mojo on hiatus, but I have also been busy preparing for the upcoming launch of my little shoppe. I have been having so much fun, and I just can't wait to share everything with you! I recently fell in love with the Lilliputs line of digi images available at Squiggle Stamps. I am not affiliated with this company or anything like that, I just think this line of artwork by illustrator Lauren Beard is fantastic. This was also my first attempt at rufflizing (the art of turning grosgrain ribbon into ruffled ribbon...it's a word I swear...lol). Hmm...the process of turning this ribbon into ruffled ribbon was quite interesting. I watched a you tube video first (okay I really watched the first minute of the video thanks to my short attention span), and then gave it a try. I may have muttered a few un-ladylike words during this process, but the end result was worth it...I think anyway. If you've been thinking about trying it, I encourage you to do so. With a little practice, you can get an entirely different look out of your ribbon. Wishing you a fantastic holiday weekend with your friends and family! 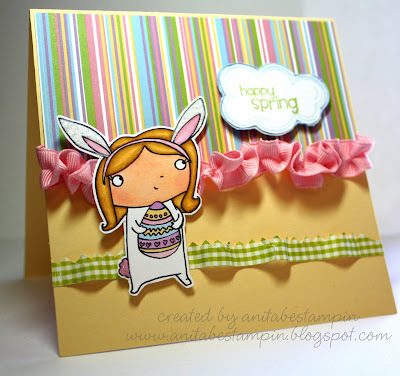 Anita - Great Card!! The ribbon looks incredible!! Can't wait to see your shoppe!!! Blessings and hugs! Well that is awesome girly! I cannot WAIT to see your new shoppe! *SQUEEEEEE* Your ribbon came out fantastically! Maybe you better have some of those "Diva Pills" on hand next time! ;O) Miss ya doll! hello Anita! I miss you and the rest of the girls :(! I hope all is well and I love your little bunny girl card she's adorable!!! This card is beautiful.. how do you do with the ribbon?? I really like.